Growing up in a chiropractic family, Dr. Davis was always adjusted by her father and enjoyed living a healthy lifestyle through chiropractic care. While in high school, she would spend summers working in his office and got to see firsthand how his patients benefited from chiropractic care. Upon receiving her undergraduate degree in Chemistry from the University of North Carolina, Dr. Davis attended Life University in Marietta, Georgia receiving her doctorate degree in chiropractic care. After graduating, Dr. Davis joined her sister in practice. 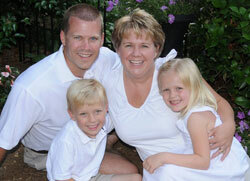 Then, in the fall of 2012, she opened Davis Family Chiropractic right here in Raleigh. In 2008, the Academy of Chiropractic Family Practice awarded a Diplomate in Pediatrics and Pregnancy Care to Dr. Davis. She’s now one of four chiropractors in the state who’ve been awarded the diplomate status. The program included 360 hours of continuing education in the care of children, pregnant women, and children with special needs. In addition, she is certified in the Webster Technique through the International Chiropractic Pediatric Association. While Dr. Davis enjoys taking care of patients of all ages, she’s passionate about working with pregnant moms, children, and children with neurodevelopmental disorders. Early detection of neurodevelopmental disorders is so important to insure proper function of our nervous system. This is why she welcomes children with ADD/ADHD, Autism, Sensory Processing Disorder, and other neurological conditions to come receive care. This desire to work with kids with neurodevelopmental disorders led her to create Building Bridges 4 Kids, a unique program to work with children with neurodevelopmental disorders through specialty care. Our practice works closely with many health care professionals such as OB/GYNs, midwives, physicians, pediatricians, doulas, lactation consultants, and PTs/OTs. Dr. Davis enjoys spending time at the beach, traveling, hiking and going to football games. Most importantly, she enjoys spending time with her husband Marc and their two children, Wyatt and Hannah.